Today a group of 30 members of Girlguiding Stockport gathered at Bramhall Green Guide Hut to package up hundreds of donations received for the Comfort Bag Project. Rainbows, Brownies, Guides, Senior Section, Leaders and Trefoil Members had been collecting items in their units for weeks and months. With additional generous donations from British Airways there was lots to do. 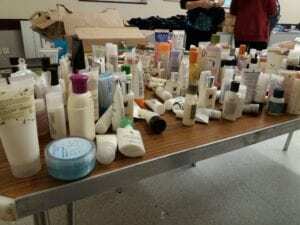 Items were grouped into type – toothbrushes with toothpaste, shampoo with conditioner, comfy socks with eye masks before one of each type were bagged up. Bags were then labelled “mens” or “womens” depending on the content before a note was added ‘Packed with Love’. The Comfort Bags will now be donated to Stepping Hill Hospital where they will be given to people admitted in an emergency.